It’s been another great year for UK boxing following a successful 2017. From heavyweight, Anthony Joshua to flyweight, Charlie Edwards, the UK pound-for-pound lists are being collated. From 10 to 1, here we see who – this writer at least – ranks as the best to ply their trade from Great Britain and Northern Ireland in 2018. It was a rough end to Yafai’s 2018. The WBA super-flyweight titlist fought and stopped David Carmona in Fresno in May and it all looked setup for the former Olympian to take on either future hall of famer, Roman Gonzalez or IBF champion, Jerwin Ancajas. Neither fight materialised. Instead Kal laboured through 12 rounds with Israel Gonzalez in a bout many observers felt he lost. The scorecards were nothing short of a disgrace, returning as 117-111 and 116-112 (x2). Yafai is going to need a massive 2019 to make up for that performance. A new entrant from 2017’s list (https://bit.ly/2Ad2cgp), is newly crowned WBC flyweight champion, Charlie Edwards. 14-1 (6KOs), Edwards started his year with a stoppage victory over Ricky Little, then four months later he finished off Anthony Nelson within three. Just last week, the losing challenger to John Riel Casimero’s IBF title in 2016 scored a unanimous decision win over Cristofer Rosales to become the newest champion at 112lb. Riding high after finally becoming a world champion in 2017, ‘Saint’ George Groves started the year as the WBA super-middleweight champion, and heading into an all British World Boxing Super Series semi-final with Chris Eubank Jr. It was a fight he was to dominate on the scorecards, and all though he had a few hairy moments late on due to a dislocated shoulder, Groves made it out with another defence under his belt and a place in the WBSS final to face Callum Smith. It was to be where ‘The Saint’s’ winning run ended as, in the unusual surroundings of King Abdullah Sports City Saudi Arabia, the London-native was to fall to a 6th round body shot KO defeat to the unbeaten Liverpudlian. His impressive showing earlier in the year keeps George in the top 10 for now. Ryan Burnett, of Belfast may now have to call himself a ‘former’ world champion, but it was all to do with injury than skill when he took on Nonito Donaire in the Bantamweight WBSS quarter finals. Burnett was the WBA champion as he entered the Super Series in November, having defended it once with a dominant decision victory of Yonfrez Parejo back in March. It was competitive while it lasted in Ryan’s November bout in Glasgow but late in the 4th, Burnett threw a right hand that triggered the back injury. He recently assured fans that it’s not career-ending so here’s to a 2019 that sees Ryan take on the losers and eventual winner of the 118lb tournament. The Body Snatcher’ did his best to maneuverer himself into a world title shot and despite failing on that count, Whyte has undoubtedly had a successful twelve months. In March, Dillian viciously knocked out a lethargic but unbeaten, Lucas Browne. Four months later he took a step up by stepping in with the recently dethroned, Joseph Parker. It was rough going and although Whyte dropped the New Zealander twice, the former WBO champion rallied late on to knock his British foe down and almost out in the final few seconds of the fight. Dillian survived the assault to earn a unanimous decision. Then to see the year out, he put a sure conclusion to his ongoing domestic rivalry with Dereck Chisora thanks to an 11th round, left-hook knockout of ‘Del Boy’ in the rematch of their controversial 2016 bout. 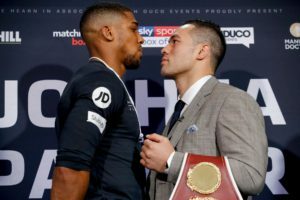 Whyte’s only defeat continues to be at the hands of heavyweight king, Anthony Joshua and a rematch of their 2015 fight is the front runner for AJ’s April Wembley Stadium date. Scottish southpaw Josh ‘Tartan Tornado’ Taylor is getting better with every performance. After a fantastic 2017, Taylor had his eyes firmly set on the big boys of the super-lightweight division. In March, after veteran, Humberto Soto dropped out late, Josh made easy work of replacement Winston Campos. Then came the big test three months later when he went up against former world champion, Viktor Postol; dropping the Ukrainian en route to a 12-round unanimous victory. In November, Josh entered the World Boxing Super Series quarter finals where he looked levels above unbeaten American, Ryan Martin. Forcing ‘Blue Chip’ into a 7th round TKO loss. 14-0 (12KOs), it’s Josh’s performance as well as the opposition he’s facing that puts him up at five in this list. The Scot’s next fight, though it still has no date, will be against Russian and IBF champion, Ivan Baranchyk. A place in the WBSS final awaits the winner, as well as the IBF strap. What more can be said about the return of Tyson Fury? After nearly three years out of the ring and his well-publicized mental health issues, Fury stepped back into the ring, twice against ‘walk-over’ opponents before going up against arguably the biggest puncher in boxing, WBC champion Deontay Wilder, at the start of December. It was a bout that saw Fury dominate the American for almost every round, but the Brit touched the canvas firstly in round 9 and then was almost wiped out in the 12th where he inexplicably rose in a way that The Undertaker would be proud of. Knockdowns or not, it was clear to anyone with eyes and a basic understanding of the rules that Tyson won that fight, and although officially he didn’t, his performance was fantastic and earns him a spot back in the top 10. What a year it’s been for IBF featherweight champion, Josh Warrington. In May, he headlined in his home city at Leeds’s Elland Road Stadium, and defeated long-time rival, Lee Selby to rip the belt from the Welshman. Josh then, in his first defence, was a clear victor over 12 rounds against two-weight champion, Carl Frampton. A fight that included a ‘Round of the Year’ contender from the first bell. Warrington said recently he’s open to the idea of WBO champion, Oscar Valdez being his next fight. Considering the calibre of his opponents this year, it’s not difficult to believe the Leeds native when he speaks. Entering the 168lb World Boxing Super Series has revitalised Smiths career that was crying out for a legacy fight and as a result, ends 2018 as the WBA and Ring Magazine super-middleweight world champion. ‘Mundo’s’ only fight of 2017 was his decision victory over Erik Skoglund in the WBSS quarter finals, then early this year he was set to face Juergen Braehmer until the German was forced to pull out due to illness. In came kickboxing world champion, Nieky Holzken and after an underwhelming 12 rounds in Germany, Smith dominated the Dutchman to a unanimous points win. It turned out to just be a taster of what Callum could do. The unbeaten Liverpudlian entered the ring in Jeddah as the underdog but forced his fight onto Groves early, with his power clearly effecting his fellow Brit with every power shot. It all accumulated in a dominant 6th round for Smith where he let loose and fired off the killer body shot that ended the bout. If not a unification bout next, a matchup with Saul ‘Canelo’ Alvarez could be up for the champion but with a fairly inactive 2017, the 28-year-old will surely be looking for the biggest fights as soon as possible. Tyson Fury may have taken some of the shine from Joshua’s 2018, but the WBA, IBF & WBO heavyweight champion – a non-mover from 2017’s list – still had a successful year with only the failure to make the Wilder fight, as the black mark on his last twelve months. ‘AJ’ firstly added the WBO strap to his collection of championship belts in April with a points win over Joseph Parker, and then took out a very game challenger in Alexander Povetkin three months ago with a six round stoppage victory. The current #1 in the division, if he fails to make fights with Wilder or Fury next year, Anthony could soon be pipped for the top spot by the Brits behind him on this list. James DeGale – The IBF super-middleweight champion fought twice in 2018 but can you name his second opponent? ‘Chunky’ regained his IBF belt in April with a decision victory in the rematch with Caleb Truax and then KO’d Colombian, Fidel Monterrosa Munoz inside three, five months later. He may be a world champion, but he has no place in this year’s list. Amir Khan & Kell Brook – It seems only right to group these two together. Will they fight? Who knows? People seemingly do care though, but neither has fought anyone worthy of ascending into 2018’s top 10. Khan made lightwork of Phil Lo Greco & slightly harder work of Samuel Vargas. Brook called out Jarrett Hurd and the recently deposed, Jermell Charlo at the beginning of the year but ended up taking on and beating Sergey Rabchenko & Michael Zerafa. Carl Frampton – ‘The Jackal’ decisioned future hall of famer, Nonito Donaire at the start of the year, stopped Luke Jackson in the middle, and was a competitive, but clear loser when he fought Josh Warrington to end 2018. The Belfast man’s future is still undecided but having already achieved world titles at super-bantam and featherweight the 31-year-old has very little left to prove if he were to retire. Billy Joe Saunders – If it weren’t for his collapsed fight with Demetrius Andrade the now former WBO middleweight champion would’ve been in the top 10, but with the situation regarding his failed drug test still up in the air and his only fight of 2018 being a 4th round stoppage over 32-13, Charles Adamu (where he weighed in at 178.5lb), it’s hard to find a place for him in this year’s list.